The aim of this study was to assess the efficacy of measuring angle of progress in the prediction of the mode of delivery in primigravida between 37 and 40 weeks of gestation. Prediction of mode of delivery, particularly identification of pregnant women at risk for cesarean delivery, has the potential to improve pregnancy outcome. Transperineal ultrasound has been suggested to be useful for predicting the mode of delivery. The study included 150 nulliparous women with a gestational age of 37–40 weeks, singleton fetus, and cephalic presentation with intact membranes. None of the women were in labor. We excluded women scheduled for elective cesarean section (CS) for a variety of indications. After history taking and physical examination, patients were subjected to transperineal ultrasound imaging to measure the angle of progression, and the mode of delivery was followed up to test the ability of the measured angle to predict the mode of delivery. At a cutoff angle of 93.5°, angle of progression correctly identified cases planned to deliver vaginally with a sensitivity of about 83.6% and a specificity of 88.9%. A statistically significant correlation was found between the angle of progression measured in the antenatal period and the mode of delivery (P < 0.0001). Translabial ultrasound-converted images to measure the angle of progression in antenatal period accurately predicted the mode of delivery, providing a more scientific basis for assessing labor. Prediction of the mode of delivery, particularly identification of pregnant women at risk for cesarean section (CS), has the potential to improve pregnancy outcomes and women's satisfaction with their childbirth experience . There is clinical significance of an unengaged fetal head (as determined by means of digital examination) before the onset of labor in the prediction of CS due to abnormal labor progress . However, there is a controversy about the limited accuracy of assessment of fetal head station by means of digital examination, especially before labor, when the presenting part is palpated through a closed cervix . Indeed, several studies have shown that digital determination of fetal head station and position in laboring women is imprecise and poorly reproducible even in the hands of experienced examiners . Ultrasound has been used extensively in the late third trimester and before the onset of labor as a more objective tool with which to predict the mode of delivery . Using translabial ultrasound, a method that measures the angle between the long axis of the symphysis pubis and a line extending from its most inferior edge tangentially to the fetal skull has been described, suggesting that this angle can predict the mode of delivery among laboring women. This method, termed the 'angle of progression' (AOP), has been demonstrated to be an objective, reliable, and reproducible method for assessing fetal head descent in laboring women . This work aimed to measure the ability of measured AOP using transperineal ultrasound to accurately predict the mode of delivery. This study was carried out in the Department of Obstetrics and Gynecology at Menoufia University Hospital between June 2015 and September 2016 and included 150 nulliparous women. The study protocol was approved by the hospital Ethics Review Committee and the Department of Obstetrics and Gynecology. Informed consent was taken from all participants. The ultrasound studies were performed by two different operators and the managing obstetricians were blinded to the results of antenatal ultrasound. The inclusion criteria were as follows: gestational age from 37 to 40 weeks, singleton fetus, intact membrane, cephalic presentation, attending at antenatal care clinic in Menoufia University Hospital, and not in labor. The exclusion criteria were as follows: multiple pregnancies, fetal presentation other than cephalic presentation, scheduled for induction of labor, scheduled for elective CS for a variety of indications, and previous cesarean delivery. All patients were subjected to detailed history taking (including patient age, present, menstrual, obstetric history) general examination, obstetric and local examination. All women were assessed by the physician on duty, and if they were not in labor translabial ultrasound examination was performed. The ultrasound assessment was performed by two different experienced operators. The examination was conducted with IBE (Providian Medical Equipment LLC., Highland Heights, OH, USA) Sonata plus ultrasound systems equipped with a 3–5-MHz transabdominal two-dimensional convex transducer. The abdominal probe was enclosed in a latex glove covered with ultrasound gel and then placed between the labia below the pubic symphysis. Ultrasound was performed in the sagittal plane, in which the long axis of the pubic symphysis could be ascertained. In this same plane, the leading portion of the fetal head could easily be discerned. A line was drawn on the screen between calipers placed at the two points identifying the long axis of the pubic symphysis. A second caliper line was then drawn on the frozen image that extend from the most inferior portion of the pubic symphysis tangentially to the fetal skull contour. The angle between the constructed lines was measured electronically [Figure 1]. Figure 1: Ultrasound image and diagram from the study material demonstrating the angle of progression of the fetal head. Data recorded using ultrasound scan included gestational age during angle measurement, fetal presentation, fetal position (occipitoanterior/occipitoposterior), fetal head circumference (cm), and AOP. Data were collected and entered to the computer using statistical package for the social sciences program for statistical analysis (SPSS version 20; SPSS Inc., Chicago, Illinois, USA). Quantitative data were described using mean and SD. Qualitative data were described using number and percent. Comparison of quantitative variables in two groups was made using independent t-tests. Association between two qualitative variables (2 × 2) was determined using the c2 test. Correlation between two quantitative variables was made using the Pearson correlation test. U-test was used to compare the distributions of scores on a quantitative variable obtained from two independent groups. 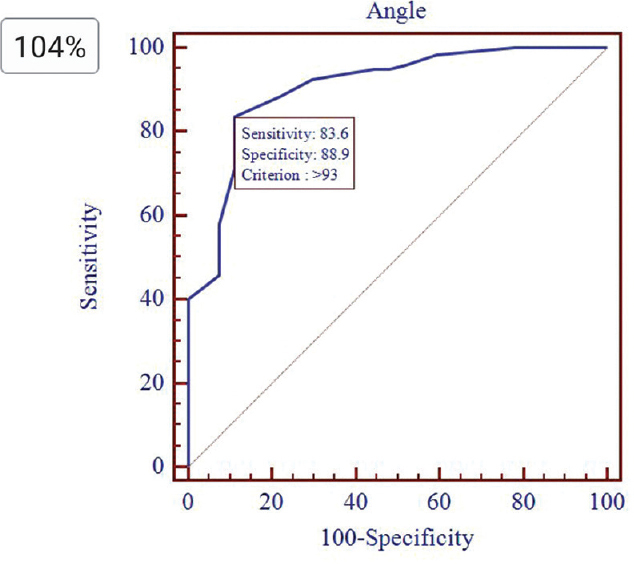 Receiver operating characteristic (ROC) curve analysis was performed to test the diagnostic performance of certain markers to predict the onset of vaginal birth. Sensitivity was defined as the fraction of parturients who delivered vaginally that the marker correctly identified as positive. However, specificity was defined as the fraction of people who delivered by means of CS that the test correctly identified as negative. The area under a ROC curve (AUC) quantifies the overall ability of the test to discriminate between those individuals destined to deliver vaginally and those who were not. In all statistical tests, a level of significance of 0.05 was used, below which the results were considered to be statistically significant. The current study included 150 pregnant women in the Antenatal Care Clinic at Menoufia University Hospital, Menoufia, Egypt. All cases were primigravida. The mean patient age in the studied population was 23.97 ± 3.78 years. The mean gestational age based on the ultrasound scan was 39.11 ± 1.23 weeks ranging from 37 to 40 weeks of gestation. The mean fetal birth weight was 3639 ± 296.6 g with a mean head circumference of 34.81 ± 1.47 cm. Nearly 81% of patients delivered vaginally as compared with 19% who delivered by means of CS. Using transabdominal ultrasound, 95.3% of all fetuses were in occipitoanterior position and 4.7% were in occipitoposterior. As regards anthropometric measurements, there was no significant statistical difference between the two groups as regards age, weight, height, and BMI [Table 1]. As regards the fetus, there was no significant statistical difference between the two groups as regards birth weight and head circumference [Table 1]. Women who delivered vaginally showed a statistically significantly higher mean AOP of 98.68 ± 6.27 versus 87.04 ± 6.62° for those who delivered by means of CS (P < 0.0001), which indicates a very high statistical significance between the angle of progress measurement in cases with normal vaginal delivery versus those who delivered by means of CS [Table 1]. Women admitted were classified according to AOP measurement into two groups. The first group included 45 women with angle of progress measurement less than 93.5°; 20 (44.4%) cases had normal vaginal delivery, whereas the remaining 25 (55.6%) cases delivered by means of CS. However, in the second group with angle more than 93.5°, 102 (97.1%) cases delivered vaginally and only three (2.9%) cases delivered by means of CS (P = 0.0001), which indicates a very high statistical significance between the two groups [Table 2]. The Pearson correlation test showed a weak correlation between Bishop score and the AOP [Figure 2]. 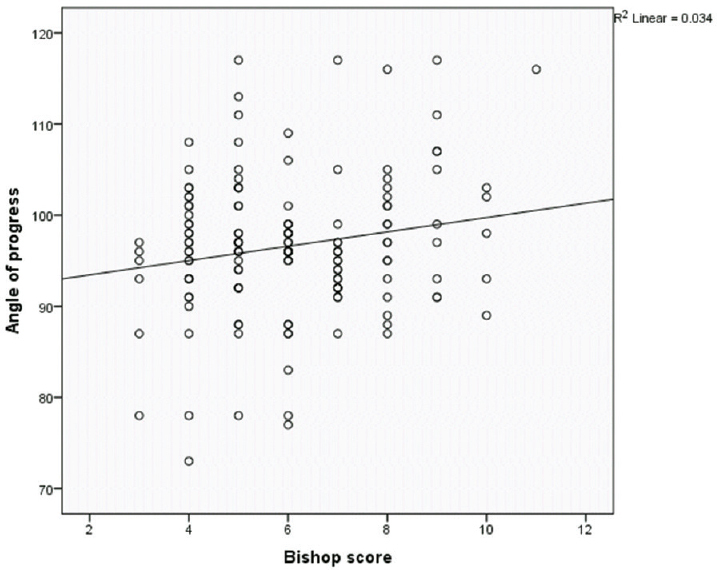 Figure 2: There was a weak correlation between Bishop score and the angle of progression. Testing the AOP to identify patients who will deliver vaginally showed a ROC curve having an AUC of 0.909 with a strong statistical significance (P < 0.0001). For a cutoff value of 93.5°, such a test will have a sensitivity of 83.6% and a specificity of nearly 88.9% [Figure 3]. Figure 3: Receiver operating characteristic curve shows the cutoff value of angle of progression (93.5°). This study was conducted to assess the accuracy of measuring the AOP using ultrasound in predicting the mode of delivery in nulliparous women. As regards anthropometric measurements, there was no significant statistical difference between the two groups with respect to age, weight, height, and BMI. As regards the fetus there was no significant statistical difference between the two groups in terms of birth weight and head circumference. AOP differed significantly between patients who delivered vaginally and those who delivered by means of CS. For a cutoff angle of 93.5°, AOP showed a sensitivity of 86.3% and specificity of 88.9% in predicting the occurrence of normal vaginal delivery (P < 0.0001). Kalache et al. prospectively evaluated this measurement and found a strong relationship between the AOP and the need for cesarean delivery. When the AOP was 120°, a probability of 90% for either spontaneous vaginal delivery or for a successful vacuum extraction existed. Forty-one patients were enrolled in the study compared with 150 in our study. All patients were recruited at the time of labor with prolonged second stage of labor, whereas we only included patients in antenatal care before onset of labor . These differences may be the cause of a higher cutoff point of the AOP (120°) compared with 93.5° in our study. Barbera et al. studied the same angle and described good intraobserver and interobserver variability that was less than 3°. Their data showed that an angle of at least 120° was always associated with subsequent spontaneous vaginal delivery. All cases were recruited in the labor ward at onset of labor; 51 cases were multiparous and only 37 cases were primigravida. However, in our study, all 150 patients were primigravida and were recruited in antenatal care clinic . These differences may be the cause of a higher cutoff point of the AOP (120°) compared with the cutoff of 93.5° in our study. Tutschek et al. concluded that, for a dynamic value of more than 135°, 94% of parturients will deliver vaginally. The study included 50 cases in second stage of labor, and the use of intravenous oxytocin to augment labor was documented in 94% of cases. In another work, Torkildsen et al. defined an AOP of 110° as a cutoff to predict vaginal delivery, which occurred in 87% of patients. These figures are greater than the dynamic cutoff values of the current work (93.5°). The study included 110 cases at labor. Induction of labor was carried out in 17 cases. Augmentation during labor was carried out in 108 cases. Mode of delivery was CS in 25.5% (28/110), operative vaginal delivery in 41.8% (46/110), and spontaneous vaginal delivery in 32.7% (36/110). Indications for CS were prolonged first stage (n = 20), prolonged second stage (n = 4), and fetal distress (n = 4). Indications for operative vaginal delivery were prolonged second stage (n = 25) and fetal distress (n = 21). In our study, we have not recorded the causes of caesarian section and operative vaginal delivery. Moreover, we have not recorded any induction or augmentation of labor. Levy et al. concluded that an AOP of at least 95° measured before the onset of labor had a sensitivity of 85%, a specificity of 89%, a positive predictive value of 98.7%, a negative predictive value of 36.3%, a positive likelihood ratio of 7.7, and a negative likelihood ratio of 0.17 for the prediction of vaginal delivery at term in nulliparous women. These figures are close to the dynamic cutoff values of the current work (93.5°) . Among the 171 women who met the inclusion criteria, 100 were nulliparous and 71 were parous. Nine (9%) nulliparous women and one (1.4%) parous woman underwent cesarean delivery. The fact that the AOP in this study was measured before the onset of labor unlike other studies may be the reason why this measurement is close to our study results. We measured the AOP only before onset of labor; if another measurement had been performed in the active labor we would have been able to compare between the two readings to determine the best time for measuring the angle to predict the mode of delivery with higher sensitivity and specificity. Moreover, we measured the AOP only in primigravida. Other studies included both primigravida and multigravida patients, and hence another study on multiparous group will be beneficial for comparison between the AOP in both groups. We recommend that more studies should be conducted to test the role of AOP in the prediction of the mode of delivery. Another study design should be used to test the role of AOP in the prediction of the mode of delivery in multiparous patients and patients in active labor. Birth represents one of the most important of all experiences of human kind. It is important to remember the simple objective of every pregnancy – namely, the delivery of a healthy baby to a healthy mother. Current obstetric practice strives to avoid difficult vaginal deliveries and identify patients at risk for caesarian delivery. Our study proved that measuring the AOP in antenatal visits between 37 and 40 weeks of gestation using transperineal ultrasound can predict the mode of delivery with high sensitivity and specificity, and provides a more scientific basis for assessing labor. Yeo L, Romero R. Sonographic evaluation in the second stage of labor to improve the assessment of labor progress and its outcome. Ultrasound Obstet Gynecol 2009; 33:253–258. Shin, KS, Brubaker KL, Ackerson LM. Risk of cesarean delivery in nulliparous women at greater than 41 weeks' gestational age with an unengaged vertex. Am J Obstet Gynecol 2004; 190:129–134. Olsen, O; Clausen, JA (12 September 2012). "Planned hospital birth versus planned home birth". The Cochrane Database of Systematic Reviews (9): CD000352. doi:10.1002/14651858.CD000352.pub2. PMC 4238062 . PMID 22972043. Dupuis O, Silveira R, Zentner A, Dittmar A, Gaucherand P, Cucherat M, Rudigoz RC. Birth simulator: reliability of transvaginal assessment of fetal head station as defined by the American College of Obstetricians and Gynecologists classification. Am J Obstet Gynecol 2005; 192:868–874. Dietz HP, Moore KH, Steensma AB. Antenatal pelvic organ mobility is associated with delivery mode. Aust N Z J Obstet Gynaecol 2003; 43:70–74. Barbera, AF, Imani F, Becker T, Lezotte DC, Hobbins JC. Anatomic relationship between the pubic symphysis and ischial spines and its clinical significance in the assessment of fetal head engagement and station during labor. Ultrasound Obstet Gynecol 2009; 33:320–325. Kalache KD, Dückelmann AM, Michaelis SAM, Lange J, Cichon G, Dudenhausen JW. Transperineal ultrasound imaging in prolonged second stage of labor with occipitoanterior presenting fetuses: how well does the 'angle of progression' predict the mode of delivery. Ultrasound Obstet Gynecol 2009; 33:326–330. Barbera AF, Pombar X, Perugino G, Lezotte DC, Hobbins, JC. A new method to assess fetal head descent in labor with transperineal ultrasound. Ultrasound Obstet Gynecol 2009; 33:313–319. Tutschek B, Braun T, Chantraine F, Henrich W. A study of progress of labour using intrapartum translabial ultrasound, assessing head station, direction, and angle of descent. BJOG 2011; 118:62–69. Torkildsen EA, Salvesen KA, Eggebo TM. Prediction of delivery mode with transperineal ultrasound in women with prolonged first stage of labour. Ultrasound Obstet Gynecol 2011; 37:702–708. Levy R, Zaks S, Ben-Arie A, Perlman S, Hagay Z, Vaisbuch E. Can angle of progression in pregnant women before onset of labour predict mode of delivery. Ultrasound Obstet Gynecol 2012; 40:332–337.